It failed to ring a bell, when a New York educator shared with me a Chinese proverb that said “Tell me, I forget; show me, I remember; involve me, I understand.” Ridiculed, partly by the shame that I, a liberal arts-educated Chinese student, couldn’t recognize this brilliant quote from my own culture, I looked it up online. Several similar questions about this English translation popped up. It took a while for me to find the source of the proverb: it was Confucius. In the Chinese textbooks I used in high school, Confucius’ works totaled no more than a few sentences and were mostly about how to be a humble student. But this fall, for the first time since the founding of People’s Republic of China, Beijing high school students will study Confucian philosophy systematically from textbooks, an experiment that might extend nationwide. Interestingly, those textbooks will not only teach Confucian classics, but also compare Confucius with Socrates and other western philosophers, a clear sign that China is reviving and guarding its traditional culture against the influx of western values. In other words, Confucius is back in China. Time magazine journalist and longtime Beijing resident, Michael Schuman, looks at this revival in his new book Confucius: And the World He Created (Basic Books, 2015). 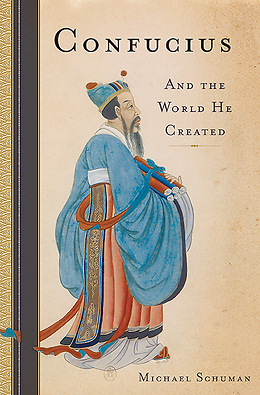 More than just a history lesson, Schuman shows Confucius’ modern day influence in East Asia. By documenting China’s and other East Asian countries’ Confucian moments, Schuman hopes to help the non-Chinese audience understand where East Asia is going. Even though many people in China might not have studied Confucianism through textbooks, the influence of Confucius never went away. For example, East Asians, including the Chinese, have always been taught to respect their elders. Schuman opens with a personal experience with Confucianism. At his wedding, he had to bow down, forehead-to-the-floor, to his Korean in-laws. It was against his personal principles to bow before anyone, but for his wife, it was not negotiable. Schuman was amazed that his wife, a journalist grew up in the West, turned into a committed Confucian when it came to showing respect to parents. Make no mistake. Confucius was not an evil monster who forces westerners to bow down. Confucius was an ethical philosopher, primarily concerned with proper relations between people and with how people should behave according to their relative roles in different relationships, which in his society (5th century BCE), were more hierarchical and strictly spelled out. Confucius defined important relationship pairs including the king-minister, father-son, and husband-wife. These relationships were not one-way streets. A minister had to be loyal to his king, and the king had to be benevolent to the minister in return. If proper conduct between the two sides were not observed, each was within their rights to seek recourse — the king could punish the minister, or the minister could stop serving the king. Confucius and his teachings have been applicable to many people throughout history. In his book, Schuman shows that the Great Sage has been everything, morphing from Confucius the man, to the teacher, to the father, to the businessman, and to the Communist. Of all the identities of Confucius, perhaps the hottest one now is Confucius the Communist, especially now that the Chinese Communist Party is holding his hand. Last September, Chinese President Xi Jinping showed up unexpectedly and made a major speech at a commemoration that marked the 2,565th anniversary of Confucius’ birth, a move that was widely considered as one of many signals that the Chinese government was pulling Confucius back to the center of discussion. President Xi said in the speech that the Party has always learned from Chinese traditional culture and Confucianism should play a greater role in government efforts to build new social values. It is easy to reach the conclusion that the Party draws on Confucius in the name of Chinese tradition to validate its legitimacy. But, it would be lazy to just say that the Party is turning Confucianism to secure its one-party state. The Party, actually, is also looking to find answers or better management skills from Confucianism, to solve the moral problems that capitalism and materialism have brought to China, following Deng Xiaoping’s reform and opening up policies. These problems, called the “moral crisis” (道德危机) by Chinese people, are everywhere – corruption in government, unethical and criminal business practices, and shocking disregard for fellow citizens. As the Party turns to Chinese traditions for help, Confucius can teach today’s China a thing or two. On government, he said officials should “govern with clean hands and engage in public affairs diligently” and “be frugal and faithful to moral principles and adopt strict self-discipline against extravagance.” Confucius worried that people cared too much about personal gain: “He who acts with a constant view to his own profit will be murmured against.” He advocated being a good samaritan, praising his disciples for helping farmers. Modern issues, of course, are much more complicated than those in Confucius’ society. It is hard to know if the Party can find Confucian ways to solve all the current problems it is facing. Right now, it is pushing scholars to sort out theories that will work. There are good reasons for the Party to turn to Confucianism, as this philosophy has proved to be successful in helping other Asian countries’ economies to grow in the 70s. Schuman uses the economic successes of Japan and the Four Little Dragons last century to demonstrate to readers how Confucianism contributed to transforming those countries into engines that drove East Asia’s capitalist ascent. In addition to an inquiry for a better business model, Chinese have taken note and are looking towards Confucianism for the ideal businessman. Ru shang (儒商, Confucian businessman or Confucian entrepreneur) has become an ideal to businessmen who want to set themselves apart from bao fa hu (暴发户, parvenu), or jian shang (奸商, unscrupulous merchant), who don’t care about regulations or social responsibilities. Like ru shang, anything infused with Confucianism and Chinese traditions are popular topics of public discussion. Chinese people embrace Confucianism to find ethical answers for capitalism in modern society. Confucius has not always enjoyed such popularity. In the early twentieth-century, the founders of Chinese Communist Party thought Confucianism, which had been a cornerstone of Chinese culture since the Han Dynasty, was a stumbling block to China’s modernity. During the Cultural Revolution, Mao Zedong aimed to eradicate Confucian influence in the society. Confucian temples and relics were smashed, and professors who refused to criticize Confucius suffered persecution. “It doesn’t matter if Mao eradicated it or not,” said Michelle Chen, a 30-year-old professional in Shanghai, “we still treat each other in a traditional way.” But when asked the revival of the Confucianism in China, she said “my friends and I didn’t even notice the trend of Confucianism coming back. We don’t really care.” Like me, Michelle belongs to the generation that did not receive much education in the Confucian classics. Thus, a lot young people like her might feel no urgency to study it now, which raises a big question of how Confucius can find his way back to this generation. There is an even larger question mark, a fundamental one, of whether the principles Confucianism could guide China’s modernization. The Party could be practical, as it always is, to “select the refined and discard the crude”(取其精华，去其糟粕), and to “make the past serve the present, make foreign things serve China” as what Chairman Mao said. But it’s unknown whether the Party could create a perfect new theory by combining Confucianism with modernity. Today, the Communist Party under Xi and a desperate population look to Confucius. But no one knows if Confucianism is the answer, yet no one knows the life expectancy of Confucius this time. Nina Huang is a journalist from China who has lived in New York City for six years. She holds a master’s degree in media and communications from New York University.